Viscera Cleanup Detail is a satirical science fiction janitorial simulation game developed by the studio RuneStorm and released in 2015. In it, you play a hapless janitor tasked with cleaning up the gory aftermath of gunfights that have taken place in various science fiction locales. In other words, in Viscera Cleanup Detail you clean up the messes left behind by what are essentially the protagonists of other first person shooters. In Viscera Cleanup Detail your only objective is to clean levels that are prepopulated with dead bodies, shell casings, bloodstains, and other viscera. In this video I do anything but clean, and actually leave the level I have selected, "Evil Science", even dirtier than it was to begin with. "Evil Science" is one of the bigger levels in the game and I selected it to try to make my pile as big as I could. The janitor is equipped with just a mop and their hands (though they can find other tools in a level). In this video, I only use the mop to try to dislodge a limb that is stuck under a table and otherwise just use the janitors' ability to carry things to create the pile. What is definitely the most striking thing about Viscera Cleanup Detail in comparison to the other games in this project is that Viscera Cleanup Detail is messy. Games like Dishonored or Skyrim have a great deal of violence in them but are relatively clean and bloodless. It may at first seem strange that Viscera Cleanup Detail, a game without any violence to living people, is much gorier than other games that do have that kind of violence, but in fact the exact opposite is true. Games that have violence as a regular mechanic need it to be just that: regular. The effects of violence are so often deemphasized because the point of these games is not to center on the violence but instead on the story being told, worlds to explore, or puzzles to be solved. Violence against people occupies the same register as "force applied to object". When violence is just a repeated action for progression it's not just desensitized but actively aesthetically dulled as well. Viscera Cleanup Detail, on the other hand, is a game that is actually about violence, satirizing the very over the top blood and guts violence seen in many other games and movies. This satire isn't really of games like Dishonored, but geared a bit more towards the very adolescent violent fantasy of games of the DOOM era that persist in gaming culture. Because Viscera Cleanup Detail is about violence, the traces of violence in the level are extremely exaggerated and vivid. It's precisely the remove from, and reflection on, violence that affords it being so visible in the game. Bodies, and body parts, serve a unique function in Viscera Cleanup Detail as compared to the other games in this project: the player just needs to clean them up, just like they would a broken test tube or a spent shell casing. Bodies are appreciated entirely on the level of the object, as the undesirable object. It's this undesirability that drives a lot of how bodies work in Viscera Cleanup Detail: for example, dropping a body part causes a new bloodstain to appear on the ground. Improper handling of bodies can create more work for the player in the long run, and it would just be better if they were gone. 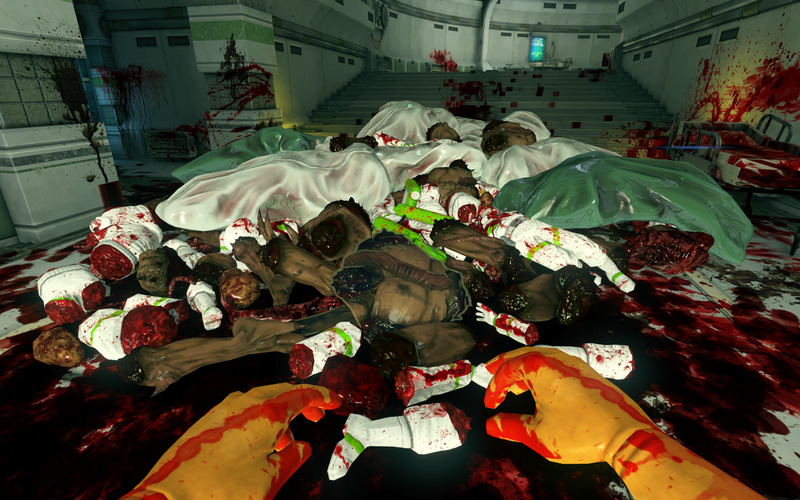 All "trash" in Viscera Cleanup Detail is incinerated (a commentary on dispassionate corporate treatment of human lives, to be sure, but also echoing genocidal methods for corpse disposal), meaning that these bodies need to be a certain shape and size- they are designed with the constraint that they need to fit into the incinerator. They are born dead, messy, awkward, and useless, in order to be destroyed. Like all the other bodies in this project, their mechanical function and infrastructural purpose defines their representation and their corporeality.